Posted on October 16, 2006 by Alicia Bay Laurel	in Blog. 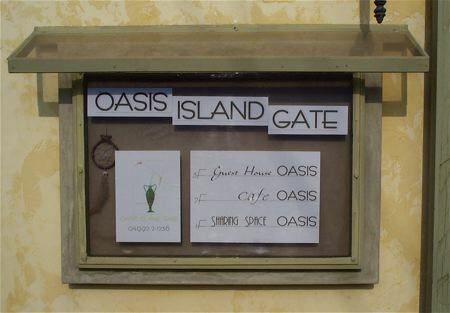 The Oasis Cafe’s exterior sign. 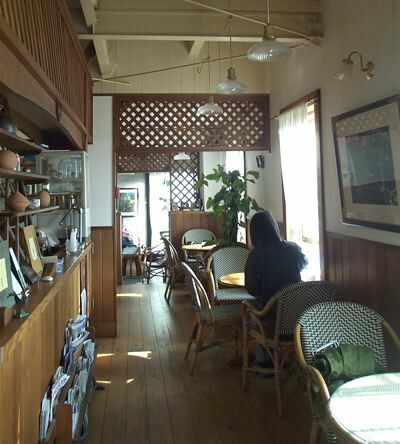 Junko Aoyama and her husband own and run the Oasis Cafe, Inn and handcraft shop in Moto Machi, Ohshima’s largest town. 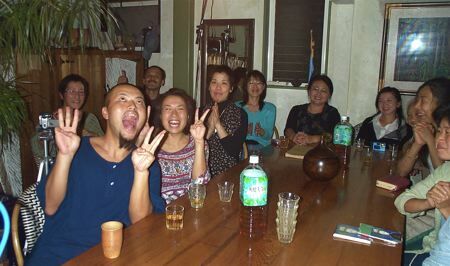 A dear friend of Mana’s, Junko was easily persuaded to host a dinner party and concert for me and Mayumi. 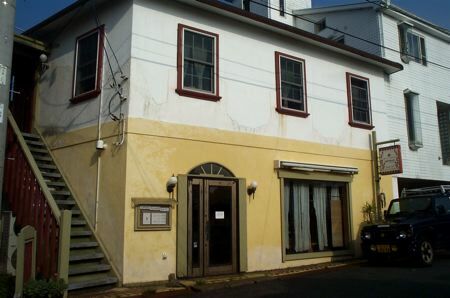 Her husband, an artist and carpenter, created all of the furniture and interior decoration for the cafe and inn, as well as an impressive collection of bonsai in the cafe’s garden and ALL of Junko’s clothing. 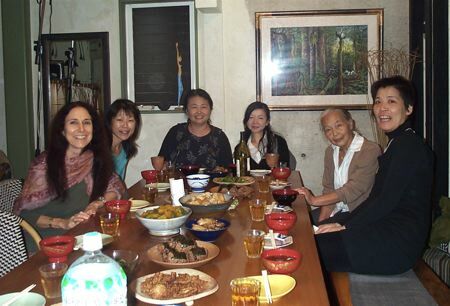 Junko is a master chef and she set an unforgettable meal before us. The dinner included grilled lotus root, slices of kabocha pumpkin, rice balls with ume plum and nori, grilled peppers, a vegetable stir fry with aburage (deep fried tofu), the grilled reef fish that Taro brought, and deep fried fish dumplings and mashed Ohshima potato. Next to me is Tammy, then another Mayumi, recently back from visiting Hawaii, next to her, a friend of hers, then Taro and our Mayumi. 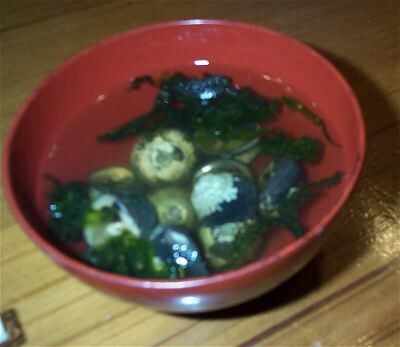 In the red bowls, sea snail soup with sea vegetables. The trick is to remove the tasty sea snail from the shell with a toothpick without its slender tail breaking off inside the shell. Mana can do it perfectly, resulting in a four ringed spiral of snail. 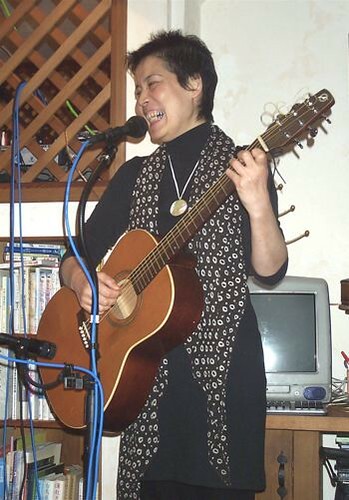 Mayumi opened the show with four deeply felt songs. 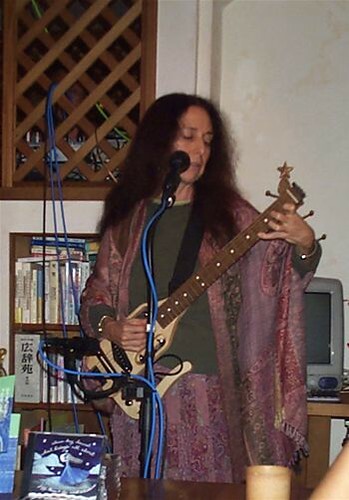 I sang (and danced) songs from What Living’s All About, using the karaoke CD from the master mix behind my voice and guitar. Tomo, who works for the Aoyamas, gave us the wildest applause. Everyone enjoyed the show. 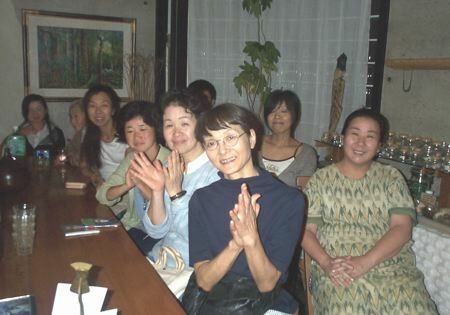 That’s Junko, seated on the right.